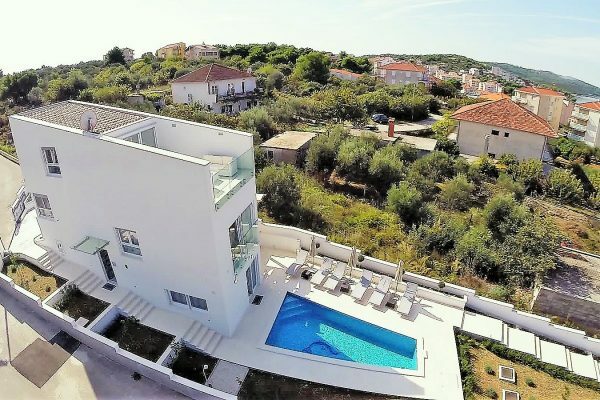 TG1396 – A lovely family house for sale Ciovo is south-oriented, with a total surface of 400 m2 and a beautiful view of the sea. The house is situated on the island of Ciovo, on a plot with a total surface of 560 m2. At a distance of only about 50 meters from the sea. This is a semi-detached object consisting of three units. The first part is the main object spreading over three levels. The basement space comprises a spacious cellar with a hardwood table, a big kitchen, a brick stove and a fireplace. This level also features a sauna with a shower and a toilet, plus a separate storeroom and a wine cellar. The ground floor consists of a spacious living room, a dining room, a kitchen with a kitchen island, a bathroom and a storeroom; here you also have a spacious stone fireplace. This level has access to outside space with a big covered dining area. The garden offers enough space for the future owner to build a pool if wanted. The first floor consists of four bedrooms, one of which includes an en-suite bathroom; this is the master bedroom with a walk-in closet and a private balcony offering an unobstructed sea view. The upper floor includes one more bathroom meant for the remaining three bedrooms. One of the bedrooms has a sea-view balcony. The other part of the property is a house consisting of two separate duplex apartments. Each ground floor level consists of a spacious living area with a functioning fireplace. The ground floors also include a toilet. Here is also a covered porch area with a view of the sea. The upper floors comprise two bedrooms and one bathroom. 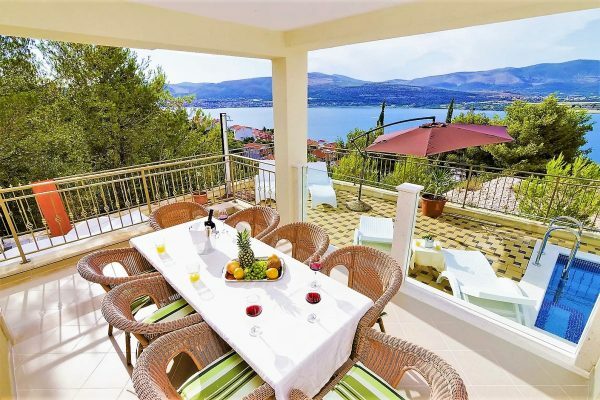 Both apartments feature loggias with wonderful views of the sea. This house for sale Ciovo is carefully decorated, with a lot of attention being given to the details. Top-quality materials were used in the building process, which includes a lot of wood and stone. The property definitely has personality and charm, its location is really quiet, in the vicinity of several beautiful beaches. All the amenities are within a short drive. The property was built with a valid building permit and it is completely legal.